The G2 comes with the usual set of organizing apps and Polaris Viewer 5 document viewer. Unfortunately, you'll have to pay extra for the document editing version of Polaris Office package. So, you can view documents - Word, Excel and PowerPoint documents and PDF files are supported. The G2 could become the essential presenter tool with SmartShare. It can stream content over HDMI (via the SlimPort) or over Wi-Fi (Miracast) and audio over Bluetooth so you can run the presentation from your G2. The app can also push content to compatible LG devices with Beam. The calendar app has a split screen interface - the top part is reserved for the monthly calendar and one on the bottom for the agenda/daily/weekly view. This way you will always have your monthly view visible. The border line between the two sections is not fixed and you can easily move it. You can hide the monthly view completely, but you can't do the same with the other section. In case you want to enjoy the calendar full screen without any additional views, just turn the phone landscape. The G2 is syncable with multiple online calendars. 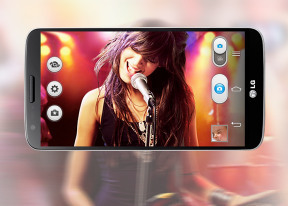 The LG G2 features an alarm clock application, which lets you set multiple alarms, each with its own start and repeat time, and ringtone. You can enable application autostartup, so the calendar/email/music player/ tasks/weather app launches when the alarm goes off. The organizer package also includes a useful voice recorder and a nicely touch-optimized calculator. The calculator is QSlide enabled to be always at hand. Notebook is more advanced and lets you create books with multiple pages, add multimedia, draw and eventually export as PDF and email them. There's also a nice animated weather app that can show you the forecast by the hour, for the next four days week. The LG G2 managed to get GPS lock in about a minute from cold start without A-GPS. A-GPS can speed up the lock (but it involves data traffic). Cell-ID and Wi-Fi positioning are also available if all you need is a rough location, but they need a data connection too. Google recently revamped the UI, but the basics are the same. Maps offers voice-guided navigation in certain countries and falls back to a list of instructions elsewhere. You can also plan routes for bicycles and public transport. A nice addition in the latest version is that Maps shows you a couple of alternative routes like the desktop version of Google Maps. For navigation, the map will cache the data it needs and will reroute you offline (so you don't need a data connection along the way). The Navigation app itself had its UI polished to match the rest of Maps. You can also search for nearby POI and go into the always cool Street View. The Google Play Store features several scrollable tabs - categories, featured, top paid, top free, top grossing, top new paid, top new free and trending. You can also check out the Play Picks, Apps to Watch, Apps Highlights and Editor's Choice categories on the Home tab for more curated app lists. The Recommended for you list is based on what apps you've installed and what your Google+ friends have liked. Apps usually have several screenshots (many even offer a demo video) so you can get an idea of what the app looks like before installing it.